Starmobile refreshes its current best-selling Up smartphone. The Starmobile Up + is a little more expensive than its predecessor and offers a bump in its internal memory. The 8GB built-in memory is also accompanied with a tweak in the software. The Starmobile Up+ will allow double tap to wake and sleep feature, just like what we've been accustomed to with the LG G2. Likewise, you'll still have the same hardware - 1.3 gigahertz quad-core CPU coupled with Mali 400 MP2 GPU. Other specs include the 1GB of RAM and 8MP/2MP camera combo (both still have BSI sensor). The "Plus" in its moniker is defined by the nifty tricks in terms of its software. This "Best Value Large Screen Phone" offers up to 3 fingers to execute commands as well as the call-and-text filtering. Its battery saver mode limits the apps' background activity and data connection. 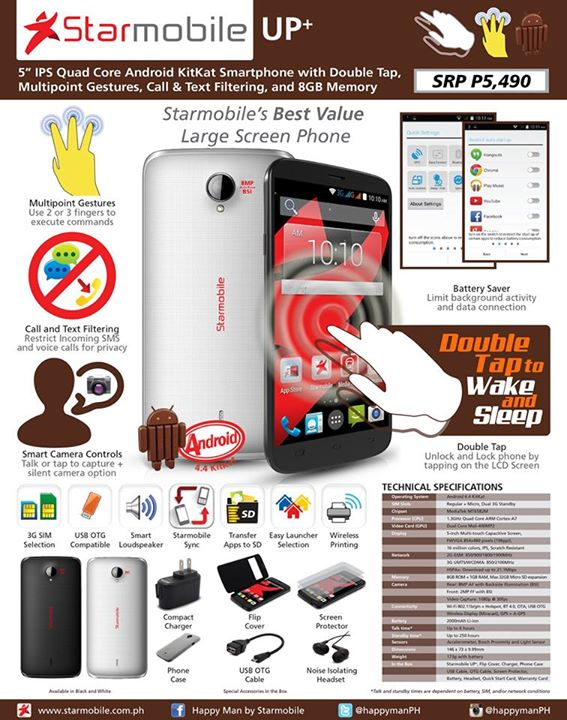 The Starmobile Up+ is still powered by a 2000 mAh of battery and Android 4.4 KitKat. This 9.99-millimeter handset is priced at Php 5490.